Raven joined the firm in February 2016 after working as a solo practitioner from 2012-2016. Raven grew up in Morganton, North Carolina. She graduated from the Ashville School in 1999. Following high school, Raven attended the University of North Carolina at Chapel Hill and earned her B.A. in English, with a minor in Creative Writing. 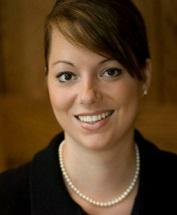 She earned her law degree from Wake Forest University School of Law (J.D., 2011). Prior to and during law school, Ms. Barron served as a Guardian ad Litem Volunteer for the 25th Judicial District (Burke, Catawba and Caldwell Counties), and developed a passion for working with the children and families of our community. Raven's primary practice areas are family, domestic and juvenile law matters, and estate planning and administration. She has a special interest in Adoption Law. Raven is a member of the Catawba County Bar Association, the 25th Judicial Bar Association, the North Carolina State Bar, the North Carolina Bar Association, and the American Bar Association. She currently lives in Hickory with her husband and three children.